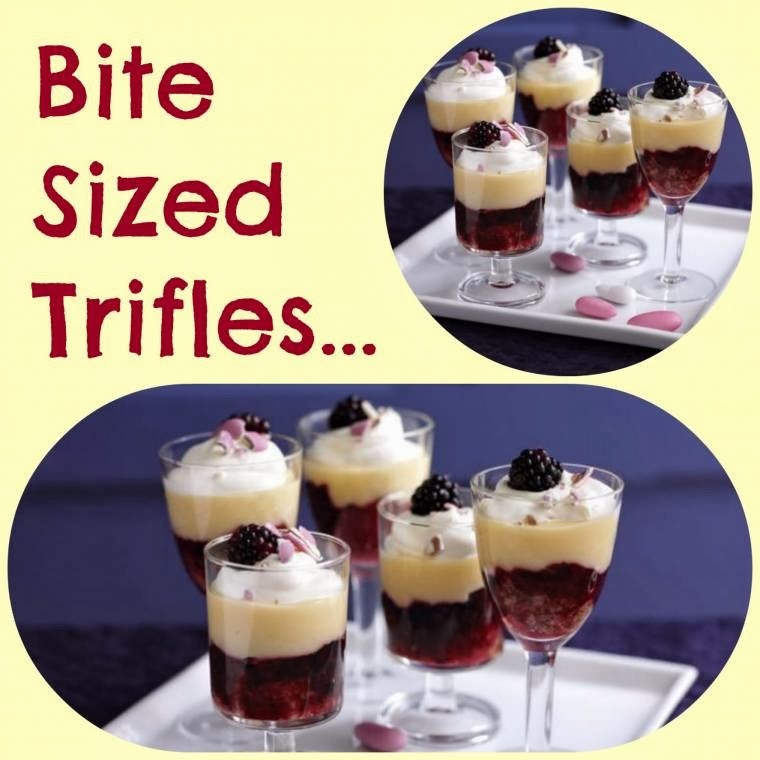 Bite Sized Trifles: Great For Birthdays, Christmas And Parties. They are one of our favourite desserts. Well mine and the husbands!! A modern twist on an old favourite. Sometimes you just need a small dainty pud after a huge Christmas lunch. 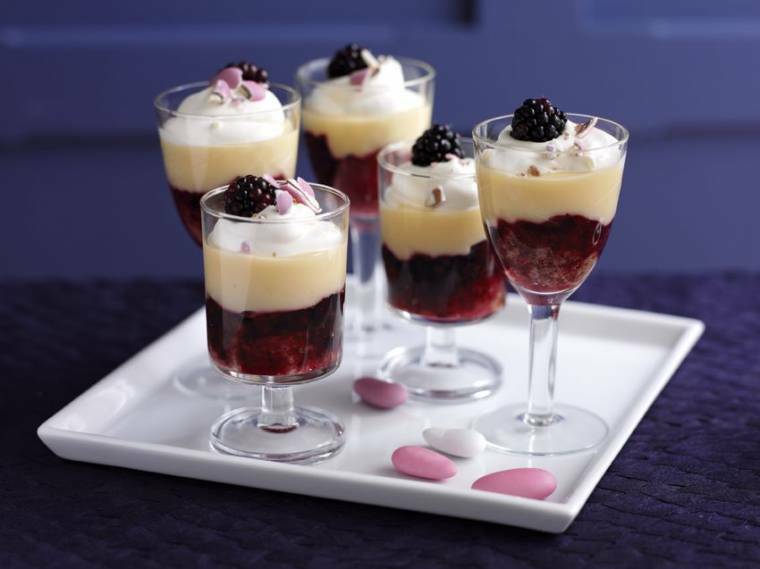 These tiny trifles add a delicious sweet finish that look stunning. 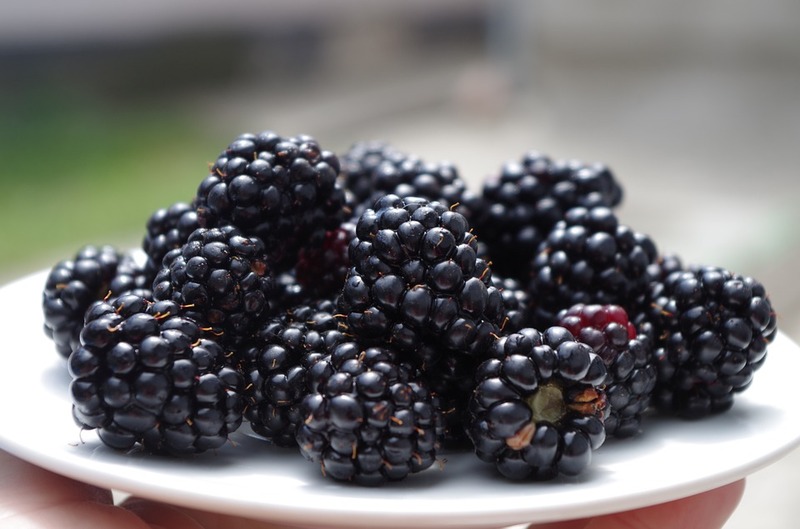 Add the blackberries, sugar and water to a small saucepan, cover and cook gently for 5 minutes then leave to cool. Cut the trifle sponges into tiny cubes & divide between the bases of 8 small 100 ml (3½ fl oz) liqueur glasses then spoon over the sherry. Divide the blackberries and cooking juices between glasses & use the back of a spoon to create and even layer. Mix the custard with the orange rind then spoon over the blackberries. Softly whip the cream and spoon over the custard. Decorate each glass with a blackberry and some roughly crushed sugared almonds if liked. Bite Sized Trifles: Great For Birthdays, Christmas And Parties . Do you fancy making these bite sized trifles? Recipe and photo credits -Seasonal Berries. Love trifles here; do you too? If so, how about trying this pear and ginger trifle recipe out? "Duck Breasts With A Port And Berry Sauce…." As usual you have a good post well done.A really great blog. Will defo try this.. This looks really good Clairejustine. You are showcasing some wonderful recipes for the holiday season! OMG, these look so delicious and beautiful too! I cant wait to try, thanks so much for sharing.